I have two shows coming up- one in New York and one in New Orleans. “(Ouroboros)” is a group exhibition opening at LeMieux Galleries in New Orleans, June 6th through July 25th. The other exhibit is called “Reinventing the Helm” and will open at Sara Nightingale Gallery in the Hamptons, June 6th through August 3rd. “(Ouroboros)” opens with a reception on June 6th, 6-9pm, in conjunction with the Julia Street Artwalk in New Orleans. “Reinventing the Helm” opens June 6th as well, 6-8pm. 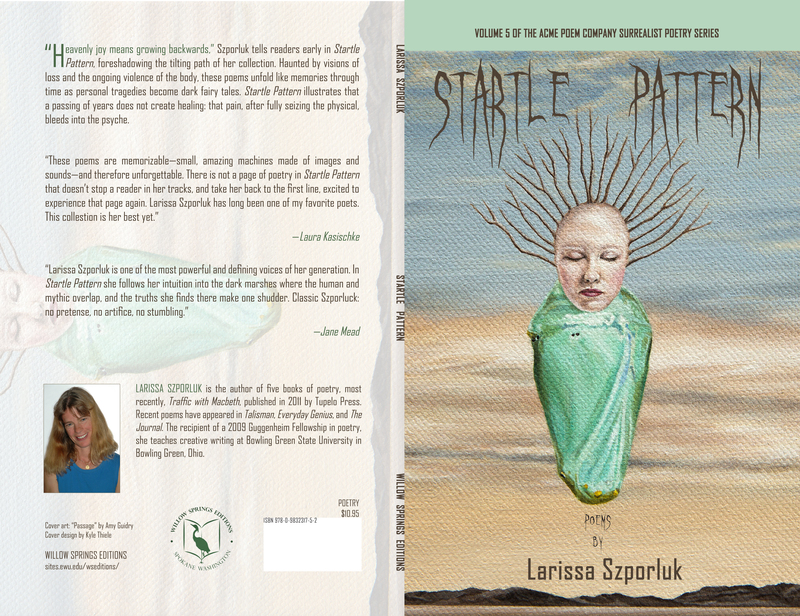 I am honored and excited to announce that my painting Passage has been selected for the cover of the latest book of poetry by Larissa Szporluk. The book is titled “Startle Pattern” and is now currently in print and available online here: http://sites.ewu.edu/wseditions/recent-publications/. I have a new painting currently in progress. 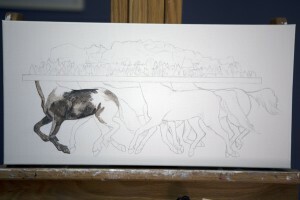 These are a couple of photos of the sketch on canvas and the beginning stages of painting. 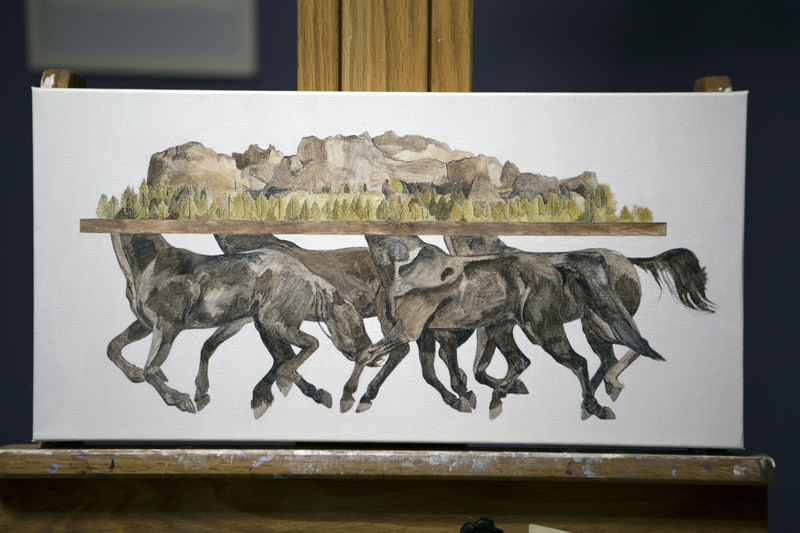 The size is 20 inches wide by 10 inches high, acrylic on canvas. More photos to be posted soon. 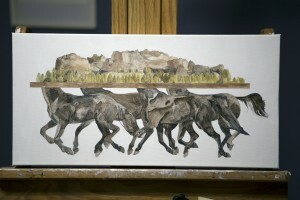 In the meantime, the series this piece comes from can be viewed here: http://amyguidry.com/wild_west.html and here: http://amyguidry.com/wolfpack.html. My most recent painting from my In Our Veins series has found a new home. Expatriate was just featured in my newsletter last week which you can get a copy of here. It is an acrylic on canvas, 20″ wide by 10″ high. 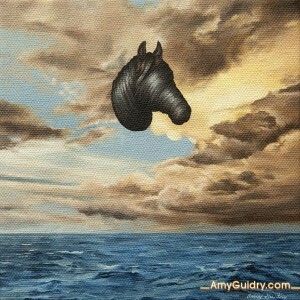 View the painting online here: http://amyguidry.com/expatriate.html.